Global Microcrystalline Cellulose Market size was estimated over USD 750 million in 2016 and will exhibit growth of over 5.5% up to 2024. Strong rise in the global overweight and obese population has been a major influencing factor, likely to make significant contribution to microcrystalline cellulose market size over the projected time span. According to World Health Organization (WHO), the global rate of obesity has almost doubled since 1980, which states that more than 1.9 billion adults above the age of 18 years are overweight, whereas nearly one third of this population is obese. The major reasons for rapidly growing obese population are changing lifestyle, sedentary jobs, considerable consumption of junk food coupled with less physical exercise. The related health risks associated with being overweight are severe and include cardiovascular disease, type-2 diabetes, hypertension, and stroke. Product is mainly used as a stabilizer, a fat substitute, an anti-caking agent and emulsifier in food items such as frozen food, ice cream, canned meat, etc. to improve its stability. As anti-caking agent in bakery food product, it is used to improve water retention and reduce food calories, which is highly preferable in a population affected by overweight. Moreover, as fat substitute and emulsifier, product is used to increase the viscosity and reduce fat, mainly for ice cream, meat products and condiments. The aforementioned trend is likely to make notable contribution to MCC market size over the projected timespan. High production cost along with lower expected yield is likely to obstruct the microcrystalline cellulose market size during the forecast timespan. This is due to the fact, the manufacturing process associated with these materials requires considerable expertise, which makes their production cost higher. Additionally, availability of several product substitutes, such as guar gum, carboxymethylcellulose, xanthan gum, etc. are likely to impede the overall microcrystalline cellulose (MCC) market size over the forecast timespan. The microcrystalline cellulose market size for wood-based sources constitutes a major chunk, which was valued more than USD 600 million of the overall MCC market size in 2016. This is mainly attained from wood pulp and is widely used as a texturizer, a fat substitute, an anti-caking agent, an extender and a bulking agent across several end-user industries such as food & beverage, pharmaceutical, personal care, etc. It is majorly applicable in the drug formulation such as vitamin supplements and tablets. 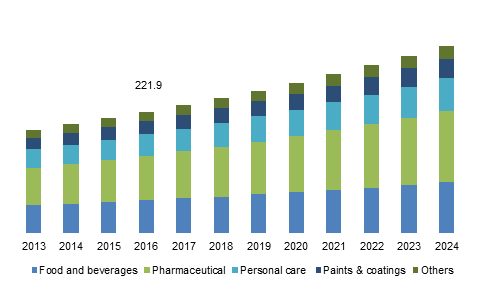 Rising R&D investment across pharmaceutical industry mainly in the U.S. will help attain positive gains to microcrystalline cellulose market size in the coming years. However, rising environmental concerns to reduce deforestation has led to product development by other sources, such as agricultural waste, cotton linters, etc. which is anticipated to gain momentum in the near future. Based on the end-user industry, the personal care industry is likely to grow at a CAGR close to 5% in the coming years. Product is widely applicable as an abrasive absorbent, emulsion stabilizer, slip modifier and an aqueous viscosity increasing agent mainly for bath, hair, eye & facial makeup, skincare and shaving products. Improving consumer lifestyles mainly in India, China, Malaysia and Indonesia owing to rising socio-economic factors will make prominent contribution to the overall microcrystalline cellulose (MCC) market size in the forecast timeframe. 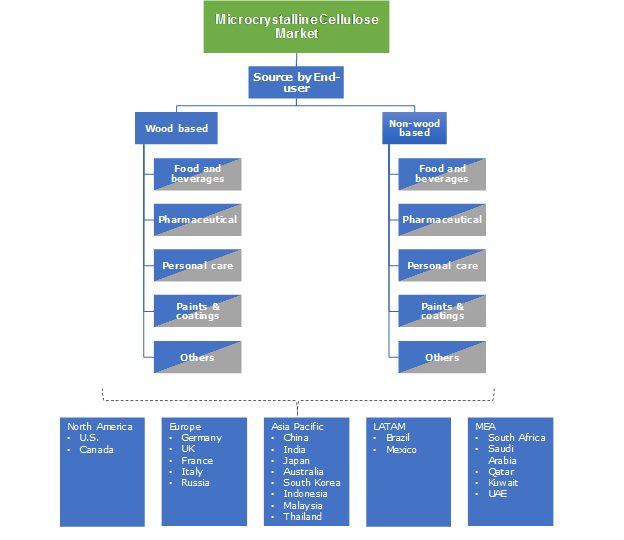 Asia Pacific market size for microcrystalline cellulose is likely to witness gains of more than 6% in the coming years. This is mainly due to rising product use across pharmaceutical, food & beverage and personal care industry in the region. Improving consumer disposable income has propelled demand for variety of personal care products including skin, hair, shaving, etc. which will have positive impact on the overall MCC market size in the forecast timespan. For instance, as per India Brand Equity Foundation (IBEF), India’s personal care industry was valued approximately USD 6.5 billion in 2016, which is projected to reach over USD 20 billion by the end of 2025, which will boost the overall microcrystalline cellulose market size in the forecast time span. Additionally, rising need for healthy and fat-free food items mainly in India, China, Malaysia and Indonesia, due to rising obese population. For instance, India and China constitutes approximately 15% of the total obese population which will augment demand for healthy food products and in turn will help attain significant gains to the MCC market size in the coming years. The major microcrystalline cellulose market is considerably consolidated with major players constituting more than 50% of the overall industry share in 2016. Major MCC market share contributors are FMC Corporation, Asahi Kasei Corporation, Mingtai Chemical, J. RETTENMAIER & SÖHNE and BLANVER FARMOQUIMICA LTDA, Juku Orchem, Libraw Pharma, Sigachi Industrial, Avantor Performance Materials, and Accent Microcell. Most of these players are making substantial investment in expanding their production capacity to gain potential edge over its competitors. For instance, DFE Pharma GmbH & Co. started a new production facility in India in April 2013 in order to meet the growing product demand from the end-user industries in the country. Additionally, Sigachi Industrial. commenced operations at its new plant located in Dahej, Gujarat in 2013, to increase the production of microcrystalline cellulose and other cellulose-based products. Microcrystalline cellulose is mainly manufactured from refined wood pulp and used as a texturizer, a fat substitute, an extender, a stabilizer, an anti-caking agent, etc. across several end-user industries including pharmaceutical, personal care, food & beverage and paints & coatings industry. Persistent need to reduce deforestation has resulted in attaining product from non-wood-based sources including reed stalks, wheat and rice straws, jute, sugarcane bagasse, coconut shells, soya bean husk, groundnut husk, etc. which possess similar physical and spectroscopic properties. Positive growth indicators in the pharmaceutical industry in the U.S. owing to consistent R&D investment which results in manufacturing variety of drugs has propelled product demand which will help attain substantial gains in the forecast timespan. Furthermore, rising demand for fat-free food in the region is another influencing factor, likely to drive overall industry size in the coming years. In Asia Pacific, there is rising trend for overweight/obese population which will drive product demand across food & beverage industry to develop healthy food items, which will help attain promising gains to MCC industry size during the forecast timespan.